His devastation of fish mortality is the strongest disaster. 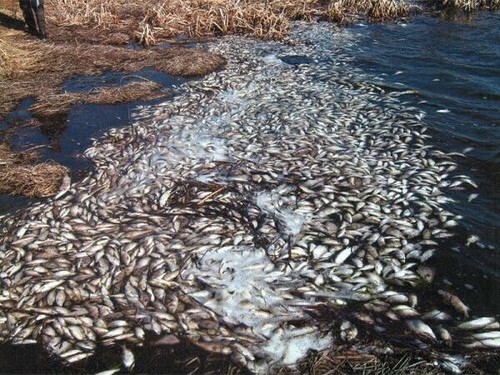 A tremendous amount of commercial fish and her fry are killed annually in many reservoirs. Plenty of good water ponds, abounding in fish, devastated and devalued Zamora. He closed the base. In many lakes, ponds for the same reason it is impossible to breed valuable species of fish, and ponds are used only for summer cultivation of carp. In winter, nedolov Lenno in ponds carp, with rare exception, completely killed by Zamora. Fish mortality occurs from a lack of oxygen in the water. In summer, the oxygen enters water from the atmosphere and stands out aquatic plants. He is continuously consumed in the oxidation (decay) of silt and dying of aquatic animals and plants, and the respiration of aquatic organisms. With a strong growth of pond or development of microscopic algae (“algal blooms”) oxygen consumption in summer may be much more income, especially at night when plants do not emit oxygen. In these cases mortality may occur in summer. But summer mortality is less common. The main danger is the mortality in the winter when ice cover prevents the flow of oxygen into the pond from the atmosphere. During this period and plants do not enrich the water with oxygen. The amount of oxygen in the water can be so reduced that the fish starts to choke. Often dies completely all of the fish population of a pond or perish a number of valuable species of fish and survives only carp. Unfortunately, often look at mortality as an unfortunate, but quite natural phenomenon. Sorry to hear about the death of the fish, emptying of reservoirs, and on the fight against Zamora care little. And sometimes even trying to profit at the expense of Zamora. The idea of the inevitability of Zamora contributed to the lack of effective means of combating this scourge. In reality, with Zamora you need to fight. Summer Zamora in fishponds is removed by water spray of garden sprinklers. 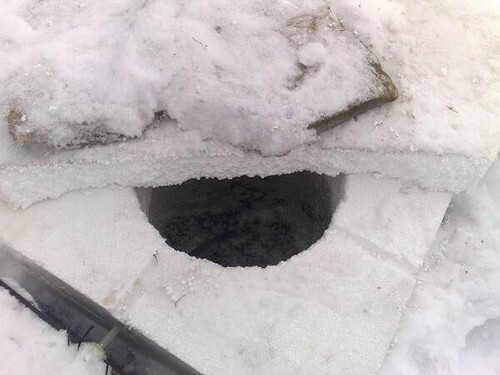 Until recently, as almost the only “preventive measure” winter Zamora used “prospirits” — a large hole, which from time to time clean the ice. In some cases, the hole vorgelegt sheaves of straw, reeds or cane, naively believing that through sheaves in the water will be a sufficient amount of air. Impression about the usefulness of the hole is created because the fish while Zamora first desperate “climb in the hole”, and then its stops. So I think that due to the hole the fish “breath”. The belief is reinforced by the fact that often after Zamora in a stagnant pond in the spring and summer detected by the fish alive. In addition, fish in the hole by the end of Zamora becomes more mobile and cautious. In fact, the ending “run” of fish means the whole or part of it have died “perished,” as the fishermen. Indeed, in the hole of stagnant pond seen a lot of dead fish lying on the bottom. In addition, part of the fish population of the reservoir stops going in the hole, since it is less hypoxic zone. Because Zamora does not always travel across the pond. Such prosperous areas are near springs, in areas with an air gap under the ice, which, when the water level falls in flooded in the autumn of tussocks, bushes, reedbeds or on the slopes of the steep Bank. Fish survival in these regions until spring and reinforces faith in action “prospirits”. To increase the mobility and care of the fish in the hole after the toga, as many fish from it took arms, due to the fact that the water in the hole a little freshening up, especially with the bursts when catching fish. In this water the fish is not experiencing dyspnea and becomes more mobile. However, in few instances, holding at this time at the hole the fish can not judge that all the fish in the pond feels just as well. Since the volume of fresh water in the hole is very small and in the absence of flow at a distance of 1-2 m from the “produh” in the pond reigns Zamora. That’s why the hole is visible near the dead fish. Water has the greatest density at +4° C. When heating and cooling specific gravity decreases. Cooling down in the hole from contact with the air, water becomes easier, and in the absence of the flow as it forms a liquid tube. Consequently, refreshing effect “produh” may not extend over the pond. Besides the hole very quickly freeze, maintaining them open is, at best, 2-3 times renewed during the day. In areas with noticeable current refreshed at “produh” water extend beyond the hole.